My first seminar of the day at the #BuyYorkshire Conference was looking at digital marketing and the impacts it has on small businesses in particular hosted by Jessica Zeun on behalf of Vodafone. 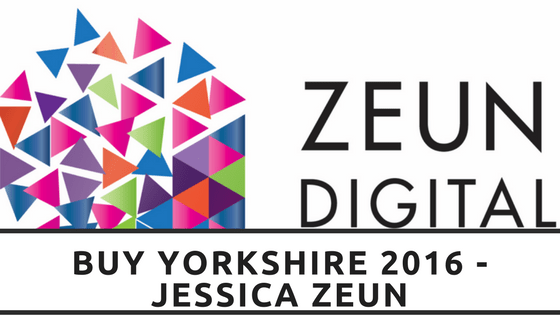 Jessica Zeun is the managing director of Zeun Digital Ltd, she has worked with digital marketing and computers, even teaching as a lecturer for Sheffield Hallam University, since 2006. I was lucky enough to partake in her talk at #BuyYorkshire and took away some interesting facts I had not considered or were aware of beforehand. 57.3 Million Active internet users. 32 Million Active mobile social media accounts – social media accounts that are accessed on our mobiles. Jessica Zeun spoke passionately about the developing 4th revolution known as the Digital age where Millennials will be the driving force for social media and digital marketing. Millennials are those individuals born between early 1980s to around 2000, many the freshest faces in the workforce and just entering in to the workforce. Millennials have grown up with the developments of the internet and therefore far more comfortable with the uses than those in previous generations are. The 4th revolution is the generation of data and customer service where marketers need to be asking questions such as Who are the customers? What do those customers like? And more importantly what problems need solving? What could your competitors do that could ruin you – could they offer a more advanced service to even just a more reliable service than yourself? Asking these kind of questions and adapting a company’s product or service to fit offers a more substantial chance at success. For example companies such as Blockbuster who ended up going bust in the early 2000’s due to their lack of interest to develop with the times and stay stuck offering physical rentals while everyone else was moving to download rentals. Other questions that can be asked is whether your current social media and web presence could be improved for better customer experience and functionality, even making it mobile accessible – 50% – 80% of traffic for mobiles and websites are through mobile applications. Those accessing social media and websites through their mobiles are accessing up to 150 times a day with 68% of people checking within 15 minutes of waking up. An astonishing 82% of buyers consult their phones while out purchasing items to look for better priced items elsewhere, or may even find a company with a better reputation in which to purchase it from. More astonishing is that 91% of mobile users access their phones mid-task for just a few minutes at a time. Therefore it is essential to be Be There – Be Useful – Be Quick. So should I change my current marketing strategy? Adapting your marketing to get in front of this audience would benefit your business significantly. Having a relevant and useful website, or even an app, can result in 1 in 3 people choosing your brand over their original intended store. 40% of those shoppers however will leave a website within 3 seconds if it is not clear or easily navigational, the action in which you want them to take must be easily understood. Jessica mentioned the Zero Moment of Truth, (More about ZMOT can be found on google – https://www.thinkwithgoogle.com/collections/zero-moment-truth.html) which looked at the introduction of online research to fulfil a need or a desire where in previous generations people would automatically go to associated businesses for a product – I.E. B&Q for garden and building materials or Mothercare for Baby goods. So get your website tested by friends and family, or even random people from social media to assure it is both clear and navigational. Figure 1 – Zero Moment of Truth model. On top of these there are also paid guest blog posts, boosted posts and apps. It is vital though that once you have a marketing strategy in place you measure it and are aware of what is and is not working. All while making sure your website is core to your strategy as it is your own platform and you control all content, functions and the way it looks unlike on social media platforms. Always monitor regularly and respond to every interaction. Collect information and learn more about your audience so you can target marketing far easier and finally generate active content – do not just sell but interact, provide sharable content and appear approachable within your posts.